If you would've asked me four weeks ago if I was looking forward to weaning Oskar I would've said no, absolutely not. But now, I guess I am. Oskar is 23 weeks old, so according to NHS guidelines, we can begin to wean him on to food in approximately 3 weeks time. Three weeks! A month or so ago Oskar still seemed so tiny, so much more newborn like than he does now. 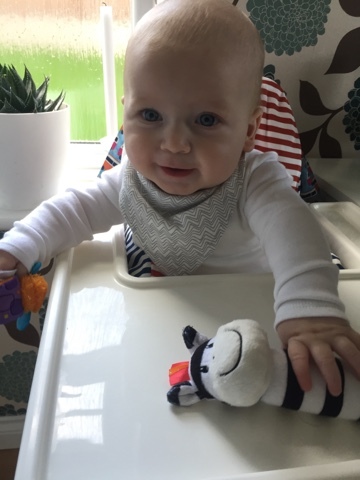 In a really short space of time he has gained strength, he has started trying really hard to sit up, he has really perfected reaching for something, grasping it and putting it to his mouth, rarely missing or dropping it. His eyes examine us as we ourselves eat our dinner, his mouth copies ours in a chewing motion. You can see his little brain working hard to understand; what is this they have on their plates? How do they make it disappear like that? Maybe I could try this too? So now, I guess, I'm feeling ready, but I guess he is too. We always knew we would wean Oskar the baby led route, but we didn't entirely know why. Just that it seems to follow common sense principles, avoid purees and spoon feeding and allows the baby more control. 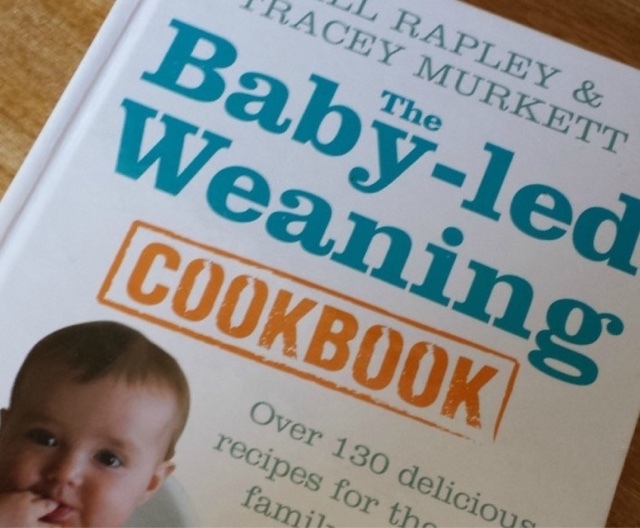 But the first thing we did in preparation for weaning was to buy Gill Rapley's baby led weaning book, which talks about how to go about this approach. For us it makes so much sense - babies are naturally designed to reach a point where their gross motor skills such as sitting and grasping are refined enough for them to feed themselves. In addition their jaw shape changes to allow them to be able to swallow food, as milk-fed infants have a protective mechanism whereby their tongue pushes out anything solid, to protect from choking, if their bodies aren't ready for food. The book resonated with us, in our beliefs, and our approach to baby led, natural, instinctive parenting, and we agreed that we are both wanting to take this approach. 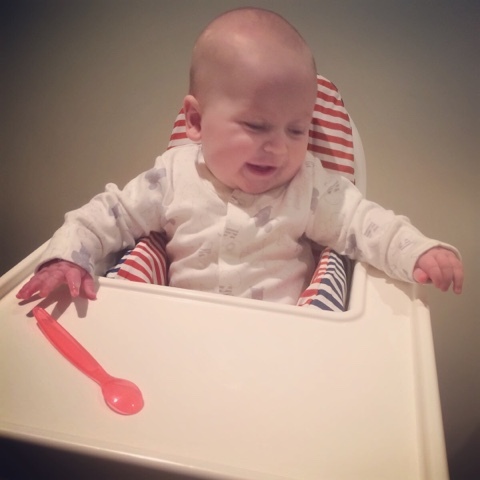 Babies weren't designed to sit and be fed spoon after spoon of pureed vegetables in our opinion! The basic idea is to offer your child food off your plate as you eat, and allow them to choose what to eat and how much right from the off. Food should be easy for them to grasp to begin with, such as a stick of carrot or a sliced bit of cheese, but not puréed or mushed. Milk continues to be the main form of nutrition until they are one, in the beginning, it is more about discovering the taste, texture and feel of foods, and learning how to eat. 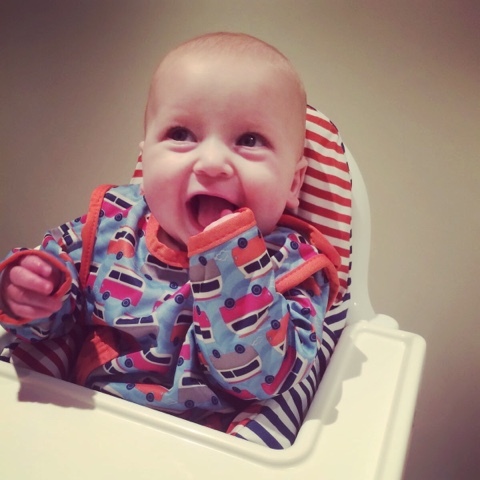 So having armed ourself with the basic knowledge we need regarding baby led weaning, in the past couple of weeks we have also started to gather a few items which we hope will assist us in our weaning journey. Firstly, we bought a high chair. A basic, foldable, easy to clean highchair. We assembled it and put Oskar in - only to find he is too small and can't reach the tray! After seeking some advice from the baby led weaning Facebook group, we have taken it back and have bought the Ikea antilop! 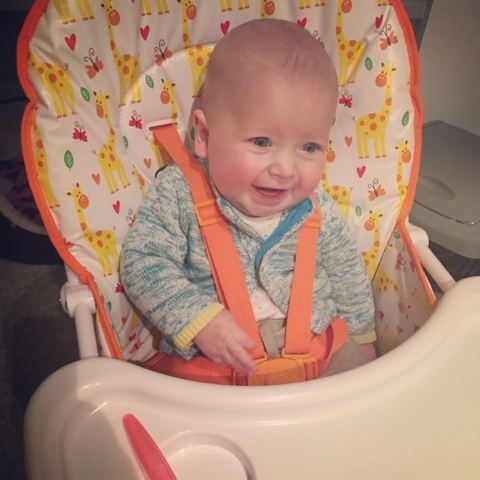 He was so happy to be able to sit in their while we cooked though, playing and chatting and giggling away, I think he will like sitting in his new chair for meals. Next we bought a new set of cheeky wipes. We already have a full set that we use for nappy changing time, but wanted a new set to keep downstairs specifically for cleaning him up after meal times. We have been advised baby led weaning can be rather messy! 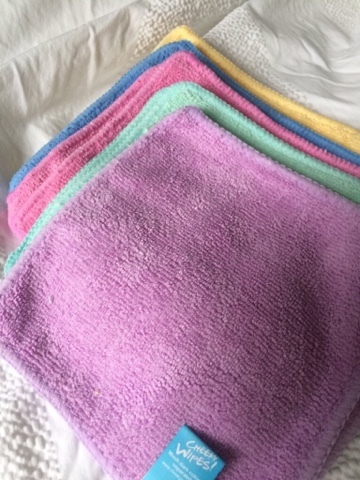 We opted for the gorgeously soft rainbow coloured microfibre wipes. Finally, we have bought a couple of cover all bibs from Close Parent, an ethically sourced, small UK run brand who specialise in gorgeous baby carriers, slings, reusable nappies and more. We think Oskar looks quite pleased with his camper van bib! So there we have it, we feel as prepared as we are ever going to, and despite wanting him to be our tiny boy forever, we are excited to begin a new chapter. Weaning, here we come!